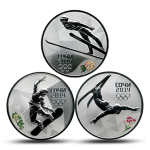 As a product partner, the Royal Canadian Mint has available the Sochi 2014 Olympic Winter Games Sterling Silver 3-Rouble Coins issued by the Bank of Russia. 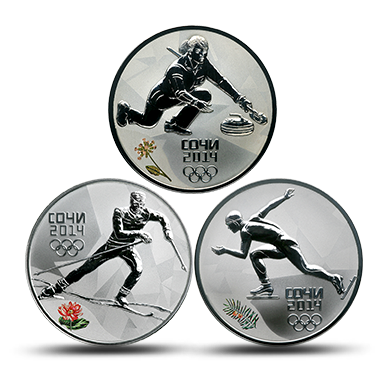 Each of these Sochi Olympic Coins is composed of one ounce of sterling silver and featured in proof quality with designs emblematic of some of the most popular sports of the Olympic games. Six of the coins are available for subscription in three-coin collections. Collection #1 is 'Hills and Thrills' with the sports of Ski Jumping, Snowboarding and Freestyle skiing highlighted. Collection #2 is ‘Swifter and Stronger’ showcasing Curling, Speed skating and Cross-country skiing. Subscription program enrollees to either collection will be shipped one coin of the collection per month for $104.95 per coin. A free collector’s box will also ship with the 1st coin designed to hold the three associated strikes - a retail value of $50. 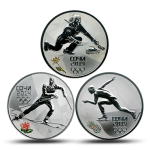 The obverse of all the Sochi Olympics Silver Coins contains the same image by E.V. Kramskaia depicting a relief image of the State Coat of Arms of the Russian Federation. Insciptions include "THE RUSSIAN FEDERATION", the denomination of the coin "3 ROUBLES" and the year of issue "2014 r."
Worldwide mintages are extremely limited with just a portion of those reserved for Royal Canadian Mint customers. For more information, or to purchase contact the Royal Canadian Mint at www.mint.ca or by calling 1-800-267-1871 (Canada), 1-800-268-6468 (US) or613-954-2626 (International).